You Manxsters are the best!! Look at those Meow Meringues!! WOW!!! I you Manxters! :-h Sorry I'm late. I was at the Kit Kat Club last night and still trying to get the shake back into my tailfeathers today. I think some of that eggnog will be a huge help. You are so sweet to have this brunch!! :-h Hi Princess Zoe and Tutti! 2 invites from 2 gorgeous ladies, I am truly honored! Thank you! Well we LOVE Christmas! :D Tutti, do you have a favorite Christmas memory? Mine is playing with Jobel in the Christmas wrapping paper. Wow! What FUN!!! Yeah I\'m glad Mr. Sam and Wally are here, too! They can give me some advice on how to be \"good\" during the holidays. ) Junior and I will take notes! )! Besides Jasper, I think you orangies are hopeless There may be hope for Junior but maybe not~:))! Wally and Sydney!! WOW! Thank you so much for coming by!! 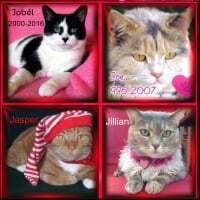 :c9 Zoe, my favorite Christmas memory is the year we were kittysitting Mom's friend's kitty Ambrose. Ambrose was a fluffy orangy and he, Hobbes and I got along really really well and we had so much fun opening all the presents that were from his furmily and mine. We were really sad to see Ambrose go home but he came back to stay several times. Wally and Sydney Rose, do you have special Christmas memories? Sydney Rose, you know we Orangies add the Spice to Life! ) I've NEVER even seen a Christmas Tree! I can only imagine what great Christmas memories I could make with one flying leap to reach the star on top! Hello every fur I'm stopping by to wish Tutti's a happy 1st year Annifursary at the Bridge. Also to say hello to Junior and every fur here!! :-h:-h:-h:-h A GOURMET GIFT BASKET!! Simon ,that is so Sweet of you!!! You are a very special kitty and I'm so glad you are Juniors furiend!! Ashley and Margo -- thank you so much for stopping by to say hi! I can't tell you what a difference it makes to Mom to see such wonderful furs! !